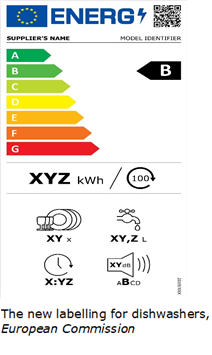 On March 11, the European Commission has adopted new energy efficiency labels which will be physically and digitally visible for EU consumers as of 1 March, 2021. Their goal is to be more understandable to consumers and help them make better informed purchasing choices. Initially the new labels will apply to 6 categories of products such as: dishwashers, washing machines and wash-dryers, commercial and household fridges and freezers, electronic displays and lamps. A reintroduction of the original ‘A to G’ for energy efficient products. These new rules will remove the A+, A++ and A+++, making the scale clearer. Registration of product information for new energy efficient products in the digital EU-wide database EPREL, allowing greater transparency and easier market surveillance by national authorities. By means of new QR codes on the labels, consumers can retrieve information from the EPREL database. A requirement to display energy efficiency class on promotional materials such as TV commercials and online ads. These simpler and more coherent energy labels will also help consumers save money as they will enable them to correctly identify the most cost-efficient products. Furthermore, Commission’s estimations value the total annual final energy savings of these new labels by 2030 at 38 TWh/year, which is equal to the annual electricity consumption of Hungary. In conclusion, along with these novelties and according to the energy efficiency of products, the Commission plans to adopt a set of 11 eco-design regulations, covering these 6 new product groups with new labels and an additional 5 product groups for which no label is foreseen. The individual product measures adopted under these acts allow consumers to buy the most energy efficient products, and ensure a level playing field for European companies. 14 product groups covered by the energy efficiency and labelling rules: dishwashers, washing machines, tumble driers, refrigerators, lamps, televisions, air conditioners, domestic cooking appliances, heaters, water heaters, residential ventilation units, professional refrigeration, local space heaters and solid fuel boilers. 9 product groups covered by efficiency requirements (and not by labelling): simple set-top boxes, external power supplies, electric motors, circulators, industrial fans, water pumps, computers & servers, power transformers and air heating products. 2 horizontal measures covering the following: standby/off mode electric power consumption of electric and electronic products, standby power consumption of networked devices. Ecodesign regulation is complementary to energy-labelling as it sets minimum requirements on aspects such as energy use in standby, reparability, availability of spare parts or facilitating dismantling and recycling of products in their end-of-life phase. Especially on this last point, since the Ecodesign working plan 2016 – 2019 highlighted the importance of eco-design in contributing to the goals of the circular economy agenda, aspects such as durability, reparability, upgradability and recyclability have introduced new requirements in the eco-design measures. The requirements are not included in the energy labelling regulations adopted in this package, although they will be in the eco-design regulations on the same products, early July 2019.